Because we could all do with some peace of mind. WE COULD ALL do with less stress in our lives. Our jobs, family life, responsibilities, all of these things and more can creep up and get a little too much to bear. Most of the time, it’s the worrying that causes the biggest problem and dealing with day-to-day life while you’re stressed isn’t the easiest. Thankfully, meditation can help you better cope with this and is a skill anyone can pick up. It and the concept of mindfulness have been growing in popularity in recent years and if you haven’t already tried it out, now is as good a time as any to start. Mindfulness is living in the moment and being aware of the feelings and thoughts that you experience at any given time. It’s not a way to get rid of negative emotions entirely -such a thing isn’t possible – but it helps you better understand your feelings and accept them for what they are. The concept is used in psychology to help with a number of conditions such as anxiety, stress, and OCD to name a few. And even if you feel like you’re fine, it’s still a useful skill to pick up and practice as the benefits will seep into other parts of your life. The apps below will help with this although it should be mentioned that you get what you put into them. Daily meditation should be the aim for most people and putting aside 10-15 minutes of your day to do this should be achievable. 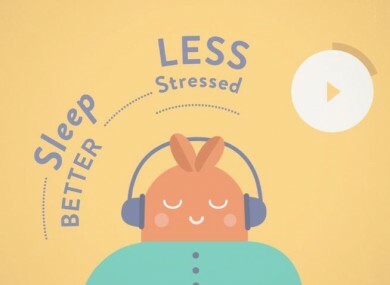 There’s a good reason why Headspace is usually mentioned when this topic comes up and as far as relaxation and mindfulness apps go, it’s one of the best. Starting off with the basics first, once you complete them, you can choose lessons based on a particular concern like anxiety, stress, focus or creativity and decide if you want each lesson to be 10, 15 or 20 minutes long. It is a subscription model – one option is a year’s access which costs €6 a month or €72 a year – but there’s a ten-day trial available for those who want to give it a try. Relaxing sounds and music? Check. Guided relaxation that can be adjusted between 2 to 20-minute lengths? Check. Timers and relaxing images? Check and check. An easy way to get away from everything should you need a bit of a breather. As the name implies, The Mindfulness App can guide you through meditation or leave you in silence except for the sound of bells. It can also alert you to when you should meditate should you have a preferred time. One of the nicest interfaces and designs of the list here, Buddhify has a collection of meditation guides based around what you’re doing instead of topics. With custom guides designed for when you’re waking up, at work, on the commute home or when you’re surfing online, there’s a guide for every part of your day. It also has a timer for unguided meditation and provides tips for improving your meditation technique. With a number of teachers to help guide you through meditation, Insight Timer is focused on developing your ability though bell chimes and guided training for both beginners and more experienced meditators. A little bit different compared to the other services on this list, Worry Watch asks you to jot down what’s bothering you at that moment. It then prompts you to revisit your notes and say whether it was as bad as you anticipated. The idea is to show you the actual event is rarely as bad as you think it’s going to be. Email “Like to start the year feeling more relaxed? These apps can help”. Feedback on “Like to start the year feeling more relaxed? These apps can help”.